The majority of us have too many utensils in our kitchens. If you are like most people, you have specialized cutting, slicing, and mixing tools that you have only used once or twice. However, you probably have a few go to kitchen utensils as well. For many people, their vegetable peeler is such a tool. These tools can be used to make vegetable ribbons, to sliced cheese, to zest citrus fruits, to make chocolate curls, to shave frozen butter, and to clean up celery among other things. We are excited to present you with our gold, silver, and bronze pick for the best vegetable peelers for sale online. We have also included one budget option that will do a good job without costing you an arm and leg. The OXO Good Grips Swivel Peeler was the brainchild of Sam Farber. He noticed that his wife was having a hard time holding the vegetable peeler because she had arthritis in her hands. So Sam asked himself, why should kitchen tools hurt people’s hands? And from that moment he began to work on a design for a vegetable peeler that was both comfortable and easy to use. In his desire to make a product that would allow his wife to peel vegetables without hurting herself, Mr. Farber created a product that has become the industry standard in comfort and in performance. It is for these reasons that we have chosen the OXO Good Grips Swivel Peeler as our gold product. Undoubtedly, you agree that the most frustrating part about using a cheap vegetable peeler is how difficult it is to get the vegetable skin off in a smooth and easy way. You usually have to go over the same spot multiple times, and you end up gouging out chunks of the vegetable instead of just removing its skin. The OXO peeler addresses this with its sharp stainless steel blade. It can easily slice through the toughest skin, including carrots, potatoes, and apples with ease. Likely you, like Mrs. Farber, have experienced the pain that comes from using a cheap vegetable peeler or one that has a hard plastic handle or even worse a metal handle. 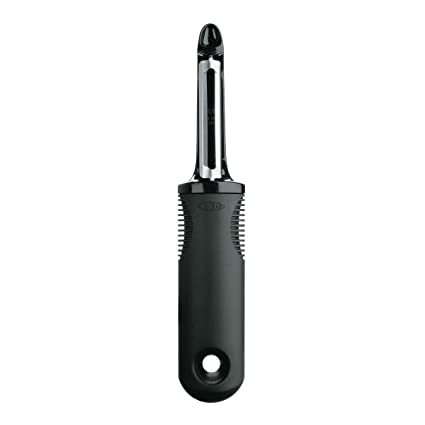 The OXO Good Grips Swivel Peeler addresses this issue since it has a comfortable handle designed to cushion your hand. The grip is nonslip. So even if your hands are wet from water or juice from the fruit or vegetable you are peeling, you do not have to worry about the peeler slipping out of your hand and accidentally injuring yourself. It is just an overall good product. After spending a considerable amount of time peeling vegetable skins, the last thing that you want to do is manually wash the vegetable peeler. That is why this model is designed to be dishwasher safe. Finish peeling your vegetables, throw it in the dishwasher, and you’re done. Admittedly, certain fruits and vegetables are harder to peel than others. Circular fruits like apples can be a challenge because of their contour. The OXO peeler addresses this because with its rotating stainless steel blade. It makes it simple to follow the contour of any fruit or vegetable and only remove the thinnest layer of its skin. It has a built in potato eye remover. This way, you can clean up your potatoes without gouging them. The ergonomic design of the product is so unique that they were awarded the Tylenol/Arthritis Foundation’s Design Award. The product is 7 x 1.2 x 0.8 inches. It weighs 8 ounces and easily fits into any kitchen setting. Customers on Amazon.com absolutely love this product. It received over 1,280 reviews, with an accumulated star rating of 4.7 out of 5 stars. What really caught our attention was that more than 80 percent of reviewers gave the product a 5 out of 5 star rating. One reviewer who works at a restaurant talked about how much she loves the OXO peeler. She said that at her restaurant, all they do is make Belgian Frites. So every day she is peeling around 200 pounds of potatoes. She loves the tool because it makes the peeling faster, less of the potato gets wasted, and she can easily remove the potato eyes. Obviously, her use of the peeler is exponentially more than what you will probably use it for at home, but if it worked for her, it is likely that it will work for you as well. 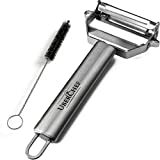 Another reviewer commented on how he has been using the peeler for the past five years. He purchased it as a replacement for the peeler that he received when he attended culinary school. He commented on how it fits perfect in his hands, it allows him to peel fruits and vegetables exactly the way he wants to, and he even said that throughout his school years, all of his fellow students,and even some of his instructors would ask to borrow the OXO peeler from time to time. While the product has lasted for some years, the reviewer says that he would have no qualms about buying another one if the need arose. Reviewer after reviewer commented on how this tool has become the go to tool they use in their restaurant or in their kitchen at home. 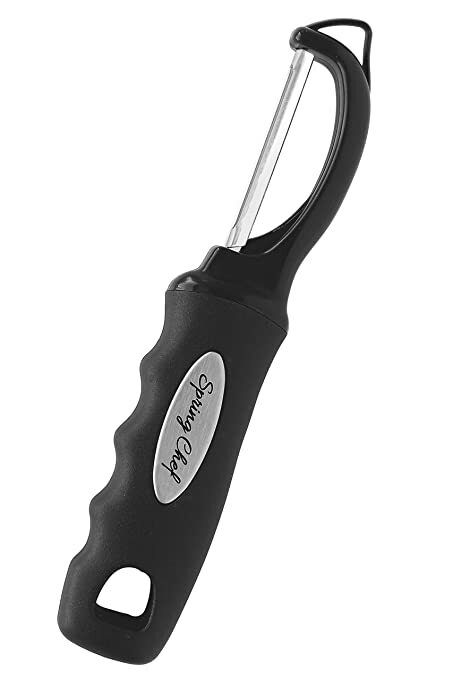 Because of its sharp blade, versatility, comfortable grip, and ability to be thrown in the dishwasher, we are sure that you will love the OXO Good Grips Swivel Peeler as well. Spring Chef has made a name for itself as a leader in the kitchen tool’s industry. Their mission is to help their clients make their culinary visions a reality. They realize that in order to accomplish this goal, their clients need to have good tools that make working in the kitchen fun, that are stylish, and that are enjoyable to use. This Dallas, Texas based company prides themselves on having products that are second to none. They research their product, they value customer feedback, and they are always striving to make a product that is better for their clients. It is for these reasons that we have selected the Spring Chef Premium Swivel Vegetable Peeler as our silver product. Equipped with a dual stainless steel blade, the Spring Chef peeler is designed to stay sharp even after repeated use. It lends itself to smooth, effortless peeling. Most people are surprised at how easy it is to peel fruits and vegetables with this inventive tool. After using the tool for the first time, many actually look for excuses to peel vegetables just because of how much fun it is. The smooth glide technology allows you to peel multiple vegetables without worrying that the space in between the blade is going to get clogged with peels. Additionally, thanks to it being dishwasher safe, you do not need to worry about cleaning your peeler by hand. A lot of kitchen tools on the market are designed in a way that favor individuals who use their right-hand. 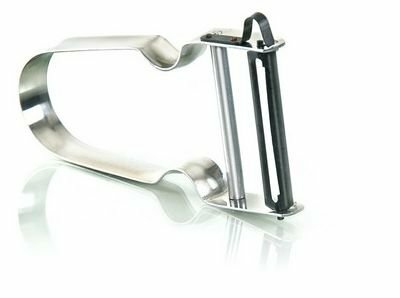 However, the comfortable nonslip handle on the Spring Chef peeler is designed to be equally easy to use for right-handed or left-handed individuals. A frustrating thing about a small tool like a vegetable peeler is that it’s easy to throw it into a drawer and then not be able to find it when you need it. That’s why this product has a unique hook that allows it to be easily stored and easily accessed when you need it. The peeler isn’t just designed to be effective, but it is also designed to be comfortable. The ergonomic design makes it easy for you to grip. It’s lightweight, so you can use it for hours on end without discomfort. It is efficient for individuals who are suffering from arthritis or carpal tunnel syndrome. You can tell a lot about the quality of a product by the guarantee that its manufacturers offer. The Spring Chef peeler comes with a lifetime warranty. Clearly, the manufacturers are confident in the product they are producing. The product’s dimensions are 7.5 x 1.5 x 0.8 inches. It weighs 2.4 ounces. 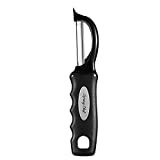 The Spring Chef peeler is one of the few products on Amazon that has received an almost perfect rating by customers. It has received 4.8 out of five stars and was rated by more than 320 customers. Almost 90 percent of the customers who use this product have given it 5 out of 5 stars. Multiple commenters expressed their surprise at the quality of this product. One reviewer purchased the product for her mother because her mother had a collection of peelers that did not work well. She said the old peelers made her feel like she was massaging the cucumber instead of peeling it. With the Spring Chef peeler, both the reviewer and her mother were able to make quick work of the vegetables they were working on. There are also a lot of comments of appreciation because this product allowed individuals with arthritis who loved cooking to be able to continue doing what they love without pain. A word of caution when using the Spring Chef Premium Swivel Vegetable Peeler, it comes with a plastic covering that needs to be removed before it is used. Many customers thought that the product was not working properly and were about to throw it away until they realized that it had the plastic sheathing. There are multiple reasons why we have chosen the UberChef peeler as our bronze option. This vegetable peeler is a versatile and multi-functional. It will allow you to peel a wide range of vegetables, including sweet potatoes, potatoes, carrots, and more. It is also possible to cut some soft vegetables and fruits, like tomatoes. It has a very sharp peeling blade that makes your time in the kitchen preparing salads and other dishes a breeze. Our bronze pick vegetable peeler boasts the sharpest blade available on the market today. In addition to using less time and energy, you will be able to make beautiful meals that look they they have been prepared by a professional chef. This peeler does not only peel the usual potatoes and carrots. It allows you to make a wide variety of recipes and dishes. First, you can easily peel a thin layer off all vegetables, which is what any good vegetable peeler would allow you to do. However, the possibilities do not end there. You can make noodles using zucchini, carrots, and other veggies. You can make thin slices of cheese and thin slices of sweet or regular potatoes to make chips. And you can even julienne vegetables. We love this option because UberChef stands behind their product. They offer a 100 percent manufacturer warranty. If you do not love this vegetable peeler, all you need to do is return it. When a company allows you to return their product if you do not like it, they are pretty sure that you are going to keep it. Individuals who have worked with this company when they were not satisfied with the product have loved the great customer service provided by the company. One individual had an issue keeping the julienne cutter head in place. The company told the individual to keep the original peeler, refunded their money, and then sent a replacement. And, of course, we took into consideration all of the reviews that are on Amazon. Reviewers have given this product a 4.9 out of five star rating. Individuals who have reviewed this product are amateur cooks all the way to professional chefs. They love the fact that it is so versatile and is able to get many jobs done. Words that you will see time and again when looking at Amazon reviews for this vegetable peeler include wow, easy, quick, fantastic, and works like a charm. Many Amazon reviewers love the fact that it is made from stainless steel material. They like the way it feels in their hand. It feels sturdy, unlike other plastic or cheaper vegetable peeler models. The pivoting head makes peeling a wide range of fruits and vegetables easy to do and with very little risk of injuring yourself. Cleaning the UberChef peeler is also super simple. It is dishwasher safe, which makes it easy to toss it in the dishwasher with all of the other dishes and let the machine do the job. It comes along with a brush that can remove any peelings that have become stuck in the blade. We have chosen the Zena Swiss Rex as our budget option. This vegetable peeler can easily fit into anyone’s budget. For the purchase of the product plus shipping, you will likely spend less on this product than what you would spend if you just went to your local grocery store, went down the kitchen supplies aisle, and chose a peeler. But just because this product is inexpensive does not mean that it is not of good quality. Some individuals who have commented on Amazon have said that they have used this peeler for more than 20 years. Obviously, it is a choice that balances budget with quality. One of the things that users have loved about this product is that the handle is made out of just one piece of aluminum. That means that unless it completely breaks in two, which rarely happens, the handle will not fall apart. It is durable and can last for many years if it is taken care of. Also, it is easy to clean. You can just pop it in the dishwasher after use, or just lightly scrub it using a little bit of soap and a rinse of warm water and it will be clean. This vegetable peeler is also lightweight. If you have a big pile of potatoes or carrots to peel, you do not have to worry about getting tired from holding this peeler. Many Amazon reviewers commented on the fact that the blade is not only sharp once you begin to use it, but it will stay sharp for years. 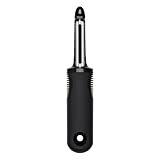 Amazon reviewers have given the Zena Swiss Rex peeler a 4.3 out of five star rating. More than 70 percent of the individuals who rated this product gave it five stars. The blade on this vegetable peeler is about an inch and a half long. This means that peeling potatoes, carrots, and other vegetables only takes a couple of minutes. Many have commented that it peels many vegetables that other peelers simply cannot. For example, some reviewers have found that it can actually peel squash. Others have found that it can peel lemons. It only takes a small amount of peel off the lemons, limes, and oranges, leaving behind the white pith. This is exactly what is needed for lemon and orange zest. One thing that many users have commented on is that the product needs to be dried before putting it in a way. If it is not dried, rust may develop. Many have just gotten into the habit of washing the product, drying it, and then putting it where it belongs. Others use the setting on their dishwasher that dries the dishes in addition to washing them. There are two basic styles of vegetable peelers that are available. The first one has a vertical blade. A vertical blade peeler has a blade that will be parallel to the handle. The second option is a yoke shaped peeler. This type of vegetable peeler has a blade that runs perpendicular to the handle. Your personal preference will play a role in deciding on the shape that is right for you. The benefit in using a yoke shaped peeler is that they can be used for a wide variety of fruits and vegetables. Most individuals find that vertical blade peelers are best for potatoes, cucumbers, carrots, and other long, slender produce. Vegetable peelers come with different types of blades. Some have a swiveling blade, while others have a blade that is locked into place. Many have found that a vegetable peeler that has a swiveling blade is more convenient to work with. They have also found that it takes off less of the fruit or vegetable because it is able to follow the shape of the thing that it is peeling. When you use a vegetable peeler with a blade that is locked in place, the force you use while peeling will determine how much is taken off. A swiveling blade just follows the veggie, taking the peel and leaving the rest behind. It is possible to purchase a vegetable peeler that has a blade edge that is either serrated or straight. When deciding on what is the best purchase for you, you need to think about what you will primarily be peeling. A serrated blade is good for soft fruits and vegetables, like kiwi and tomatoes. A straight blade is great for harder vegetables, like potatoes and carrots. Some vegetable peelers offer both. One side of the peeler will be serrated, and then the other side of the peeler will have a straight blade. You want a vegetable peeler that will be easy to use. Purchase one that has a nonslip handle so as to avoid accidents and make the job of peeling vegetables and fruit easier. Plastic handles are a great option because they do not carry bacteria and are lightweight. If you spend a lot of time peeling vegetables, you are going to want to feel comfortable while you are doing the job. Many prefer a larger, more easy to grip handle instead of a thin metal handle when they spend a lot of time in the kitchen preparing vegetables for dishes. They are usually much more comfortable. Most people are familiar with the metal blade. However, ceramic blades are also available. There are some benefits that come from using a ceramic blade that include the fact that it will not rust and will not cause a negative reaction when it is used to peel acidic vegetables and fruit. Individuals who are left-handed need to pay close attention to the type of vegetable peeler they purchase. It is best to purchase a two-sided blade in this situation since it can be used for individuals who are left-handed and right-handed. Vegetable peelers are an essential tool in any kitchen. They can make the job of peeling fruits and vegetables safe, easy, and fast. If you have ever used a paring or other type of knife to peel vegetables, you know that the job takes longer and there is always the danger of cutting yourself. A good vegetable peeler only removes a thin layer of the vegetable. This is great when you do not want to waste vegetables and fruit and also if you are going to use the peeler to slice vegetables. You can make the veggies of equal thickness, which is great for making things like potato chips. Taking time to find a version that is right for you is well worth the effort. These simple kitchen devices are versatile tools that can save you time and energy, and they can help you prepare a wide variety of dishes.